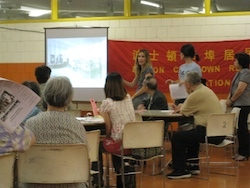 The Chinatown Residents Association met this evening in the cafeteria of the Quincy Elementary School and invited us to present the Storefront Library. Over tea, the residents were briefed on the ongoing development of the Storefront Library, and plenty of questions were asked. Some residents requested that Chinese Opera be featured in the Library, though an exhibit or group class. We couldn’t think of a better idea, and we’ll be working with members of the Association to make it happen this Fall.